Monviso seen from the Col de Chamoussiere (FR). Sunset view of Monviso from San Giorgio della Lessinia (VR), over 300km away. Monte Viso or Monviso (Italian pronunciation: [moɱˈviːzo]; Occitan: Vísol; Piedmontese: Brich Monviso or Viso), is the highest mountain of the Cottian Alps. It is located in Italy close to the French border. Monte Viso is well known for its pyramid-like shape and, because it is higher than all its neighbouring peaks by about 500 m, it can be seen from great distance, including from the Piedmontese plateau, the Langhe, the Theodulpass in the Zermatt ski area and the summits of the Mont Blanc massif. On a very clear day it can be seen from the spires of the Milan Cathedral. It has been suggested that Monte Viso could be one of the mountains which inspired the Paramount logo. In Italy is also known as Il Re di Pietra (The Stone King) because of his prominence within western Italian Alps landscape. From 29 May 2013, it has become UNESCO's heritage as a cross-border biosphere reserve with France. On the northern slopes of Monte Viso are the headwaters of the Po, the longest Italian river, the so-called Pian del Re (2,020 m). The Monviso group is surrounded by the Valle Po, Valle Varaita and, on the French side, the Guil valley. 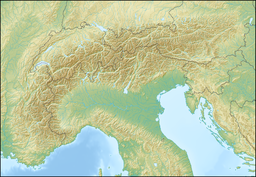 The northern sector of the group, from the Punta Gastaldi to the Col de la Traversette, is located on the French border. Monte Viso is the location of a neolithic jadeite quarry, at an elevation of 2000 to 2400 metres. Its productivity peaked around 5000 BC. The jadeite was used to make cult axes, which are found all over western Europe. One such ceremonial axe head was found as far away as a small hill called Tristia in Western Ireland and is on display in the National Museum of Ireland – Archaeology, Dublin. In ancient times the mountain was known as Vesulus. Monte Viso was climbed for the first time on August 30, 1861 by William Mathews, Frederick Jacomb, Jean-Baptiste Croz and Michel Croz. The which a long thyng were to devyse. ^ Marazzi, Sergio (2005). Atlante Orografico delle Alpi. SOIUSA (in Italian). Priuli & Verlucca. ISBN 978-88-8068-273-8. ^ Lewis C. T. and Short C., 1879, Latin Dictionary, p 1982, citing Virgil Aen. X 708 and Pliny 3. 16. 20 §117. McLewin, Will (1991). In Monte Viso’s Horizon: Climbing All the Alpine 4000m Peaks. Ernest Press. ISBN 0-948153-09-1. Wikimedia Commons has media related to Monviso. This page was last edited on 28 August 2018, at 09:14 (UTC).